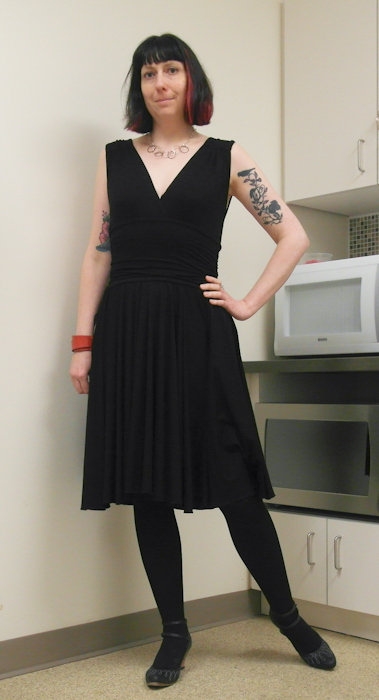 This is the other dress that I bought on Sunday at Chartreuse Style. I was going to wear my Fluevog Impulse flats (worn here) but I noticed that the upper had pulled away from the sole on the right shoe! Quelle horreur! So at lunch time I went to the Fluevog store (which is about a 5 minute walk from my office - EEEP!) to ask about where they send shoes for repairs. They said that if I brought the shoe in they could send it out for repair (I'll pay) but it will save me making a trip out to who knows where. I like this dress because the waistband is quite wide and since I have a long torso, its more comfortable. This dress made me feel like a Disco Queen all day. The low cut front and back and swingy skirt has a 1970s Studio 54 feeling. Or it would if it was gold lame or covered in sequins. Then it would be EPIC! See why I wore the cardigan? Too much skin for my new job. I'm not quite ready to start pushing boundaries. 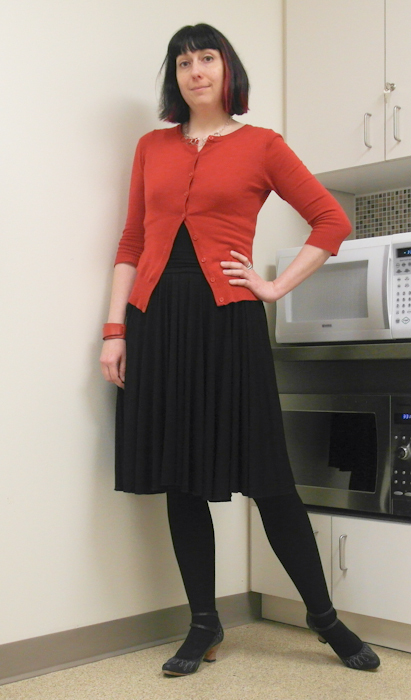 Someone came into the unused kitchen while I was setting up to take pictures of my accessories so I skedaddled! I have a full weekend planned meeting up with some bloggers! Should be fun fun FUN! Fantastic cut dress! Ohmy more shoes? Can't wait to see what you got. Quelle drag about your Impulses! I hope they can be fixed. I haven't had any issues with mine so far. I am dying to see what shoes you bought! Awesome dress - so spectacular on you. I read Sheila's remark about your impulses and laughed - I was pretty sure she was talking about your shoes but you never know. I hope they can be fixed! Disco queen under the cardi - great secrets with those special impulses. love your dress shape and nice fitting, and love that you're enjoying that disco queen feeling under your cardi all day long!! And always love your shoes! The dress is spectacular! It looks like the sort of dress that you could wear almost anywhere, depending on the accessories that you choose. It seems that you are settling in well. I adore the shape and flow of this dress!! The cardi is a lovely accent too. Great dress!! It fits you so well! I understand adding the cardi, but on it's own the the dress is great! Glad you're settling in well - have fun meeting the bloggers! If I was the owner of a fashion empire, I would attempt to woo you away from your job and let you run with it.